Are you interested in visiting an amazing vineyard to have one of the best glasses of wine you’ve ever had? Then make sure to schedule a trip to Sleepy Creek Vineyards. 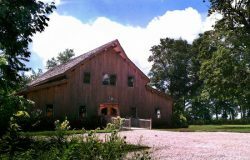 Sleepy Creek Vineyards is a winery, event space and lodge that is perfect for anyone that needs a fun getaway and a short break from everyday life. Whether you want to come by for a tasting and a tour of the winery and vineyard, or you’d like to host an unforgettable event at a gorgeous location, Sleepy Creek Vineyards is the perfect vineyard for you. Sleepy Creek Vineyards is home to a B & W—which stands for Bed and Wine. Their lodging amenities include: access to private bedrooms, wood floors, vaulted ceilings and even a fully equipped kitchen! Take some time off from your hectic life and enjoy a glass of wine at Sleepy Creek Vineyards. Booking Howl2GO Dueling Pianos’ world class show to your Fairmount, IL event couldn’t be simpler. From conventions to corporate events, weddings to fundraisers, our unbeatable Dueling Piano shows bring a high energy, interactive show that your guests will remember for years to come anywhere in Illinois!